Tour Talk: New dates for reputation! A commentary on ticket sales. Hello from Winterfell, Taylor Nation. I mean, Canada. Here at the Swift Agency, just a guy who’s been known to obtain tickets at the last minute, we’re glad there’s a few more concert dates. I was just hoping more spots would open in Canada (we don’t all live in Toronto, believe or not) and perhaps a few other nations around the world. Tickets for the new dates will go on sale January 31st at 10am local time (local time of the venue, of course). May 11: Levi’s Stadium. Santa Clara, CA. July 11: FedExField. Washington, DC. July 13: Lincoln Financial Field. Philadelphia, PA.
July 22: MetLife Stadium. East Rutherford, NJ. July 26: Gillette Stadium. Foxborough, MA. October 5: AT&T Stadium. Arlington, TX. There will be a Taylor Swift Presale for fans. If you already have signed up for the Taylor Swift Tix (aka Ticketmaster Verified Fan), you are already in with higher priority. If you haven’t you’ll get a chance this Friday, January 5th when new registrations will open at 10am EST. The presale starts on January 23. Now can we talk turkey? In case you haven’t realized, Taylor’s instant sold out concerts from previous tours had a unintentional assist. Scalpers and ticket resellers will grab as much as they could for resale. That means a lot of fans couldn’t get tickets and would try to grab them from resellers later. This means a sold-out concert wasn’t really packed until those tickets got resold. It locks out non-fans from the presale period, meaning there’s no scalper/reseller buying large quantities of tickets through multiple accounts. Obviously, spots are more likely to be left behind. On general sale, the scalpers/resellers are not as keen to invest on buying lots of tickets with the higher price tag. Their investment would have to be higher and they can’t count on a high return unless they jack the price further up effectively turning away concert-goers. This has an unwanted side effect. It’s harder to sell out a full concert – much harder. Fans that must deal with the high prices (this time from the official sites instead of the reseller sites) will usually wait to see what other options they have or to come up with the money. Will it work? I can’t really say, but both Taylor Swift’s reputation stadium tour and Ticketmaster are banking on it. My take? I don’t like this strategy too much. Before, there was a chance to grab a ticket for much less with the previous system, although it was hectic to accomplish. 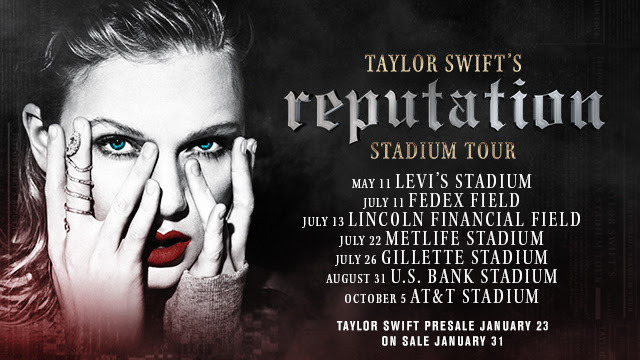 To top it off, the reputation STADIUM Tour is only doing the large stadium venues and major cities. Smaller cities and towns will have fans that can’t reach both the higher prices AND budget travel expenses. The chances of opening up a leg for smaller venues are now close to nonexistent. I also can’t say I have a better solution though. The bigger the venue, the most effective the tour concerts become. They are seen by a lot more people at once and more than likely production values will be much more impressive. I won’t deny that the price might be worth it, specially since this time the chunk taken by the scalper/reseller margin should be much less. A lot of fans might cave and take the plunge. Some might just have to rely on what online video leaks out. Coming up next year! The 60th Annual Grammy Awards. Taylor Swift has two nominations. No, no, no, chill! Taylor’s reputation is not eligible yet. It will be eligible for 2019’s (wow that is a long time to wait). She is nominated for Best Song Written for Visual Media with Zayn for “I Don’t Want To Live Forever”. She also gets a nod for writing the Best Country Song for “Better Man” as performed by Little Big Town. January 28: The 60th Annual Grammy Awards. Taylor Swift is nominated for Best Song Written for Visual Media with Zayn for “I Don’t Want To Live Forever” and Best Country Song for “Better Man” as performed by Little Big Town. GILLETTE STADIUM HAS THREE SHOWS. THE STADIUM 5 TOWNS AWAY FROM ME HAS THREE REPUTATION SHOWS. I HAVE NO MONEY, NO RIDE, NO CHAPERONES. I kinda wish she went to more places though, like South America –I know she has fans there and I feel like it doesn’t matter if she sells out the show (she’s already making a lot of money), but as long as people come and they “celebrate” with music. Yes, South America! She’s never been there (except that one time in Brazil). Unfortunately, this time this stadium-only tour does even less countries and less cities than ever before. Previous Previous post: Happy 28th Birthday, Taylor Swift!